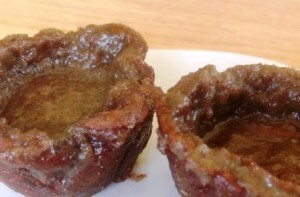 There is no butter in our butter tarts, but they taste awesome! Combine the salt, flour and Xanthum Gum in a large mixing bowl. Cut margarine into the flour mixture with pastry cutter or knife. Sprinkle oil over dough and cut in with pastry cutter. Dough should have the consistency of cornmeal. Sprinkle with cold water and loosely cut in, so all is moistened. Cover dough with plastic wrap and put in fridge for 30 min. Roll out dough in between 2 pieces of parchment paper (or plastic wrap) to ~1/8” thick. Sprinkle dough with water if it gets too dry, but don’t overwork it. Cut out tart crusts with circular cutter (bowl plastic take out container) that is 1” larger than the radius of the muffin tin cups. Form dough in muffin cups, squishing it around with your fingers to fill in any breaks in the dough or thin spots. Bake at 400°F for 10-15 min. Let cool and leave in tin for the filling. Combine the maple syrup and arrowroot flour with a whisk. Melt the coconut oil in a small pot and mix it in with the syrup mixture. Add the vanilla and ground chia/flax. Add the baking powder at the end and mix well. Stir in the pecans or raisins. Use an ice cream scoop to ladle the filling into each of the baked shells, filling only ¾ full. Bake at 325°F for 25-30 min, turning halfway through for even baking. Here is an interesting alternative for a quick and yummy tart shell. It does not taste like any tart shell you had before, but the cocoa mixes well the banana for a yummily unique butter tart experience! Peel and break up banana into food processor or sturdy blender (we use a Blendtec). Add the other ingredients on top of the banana. Pulse the blender, scraping down the sides as needed, until the ingredients combine into a Play Dough-like consistency. 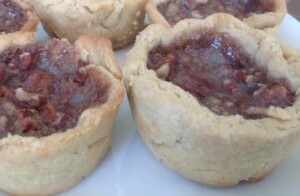 Roll out dough and fill muffin tin cups as in previous dough recipe. Make sure to lightly oil the muffin tin cups. Bake 350F for 10-15 min. This entry was posted in Recipes and tagged baking, Chocolate Chip, gluten free, Recipe, Vegan.